At the time these performances were issued the Six Pieces and the early 1897 sonata were claimed as first ever recordings. Assuming that to be true there have since been others � though I do seem to remember having seen the Pieces before the release of this 2001 recording. 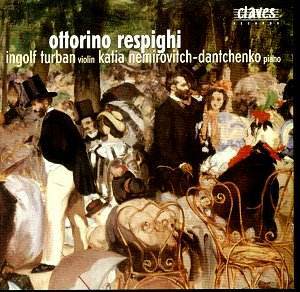 Whatever the state of play with regard to prestigious premiere discs it�s always good to be rewarded with the 1917 sonata, one of the twentieth century�s best examples of the genre but one that has garnered, oddly, fewer recordings than one would have expected. There have been the celebrity discs, Heifetz�s most especially, but I was surprised to see no more than half a dozen discs in the current British catalogue. But let�s start with that 1897 sonata, full of big, grand gestures and plying the Schumann-Brahmsian axis very adeptly, as befits a violinist-composer. The crest of the first movement, strenuous and chock full of driving passagework, still sounds rather unsatisfying and unconvincing however. A similar lack (ultimately) of definition afflicts the lyrical Schumannesque slow movement though it�s well laid out for the two instruments; the finale is better - Brahmsian in cast, certainly, but with some off-kilter gestures that attract the ear and almost manage to offset the gauche gestures and the rather repetitious writing. Turban and Nemirovitch-Dantchenko do what they can; maybe too much. Turban has recorded widely and I know he�s admired but he employs some rather arch expressive devices to heat up the romanticised profile of a work that needs to be taken rather straighter. His smeary lower string vibrato sounds out of scale to me, and the slides forced rather than felt. The melodious Six Pieces, a compound of the salon and the recital hall, are winning and warm. It�s a shame that the Melodia, the second of them, is vibrated to death by Turban but the players do well by the waltz and the Leggenda even if they can�t really salvage the more over ambitious pages of the over wrought Serenata. The Sonata receives an uneven performance with a rather slow opening movement and a tendency towards diffusion. This is something that also applies to the recording throughout; there�s not a proper balance between instruments with the piano somewhat veiled. It may contribute to a feeling of relative shapelessness in the slow movement; listen to the classic Suk-Hála recording (not currently available domestically) and you can hear how a more thrusting traversal explores peaks and troughs. Again I find Turban less than effective when he juices up his tone with smeary vibrato in the Passacaglia finale; he sounds stolid not expressive. Given these caveats I would suggest alternative recordings. The recording level is a basic concern and the playing never really gets to the heart of the matter.